Mattel selected Matrix Semiconductor's Matrix 3-D Memory (3DM) as the means to store and share entertainment content for the Juice Box personal media player. These Matrix 3DM-based cartridges, dubbed Juiceware, can contain up to 64 megabytes of on-the-go music and video entertainment. 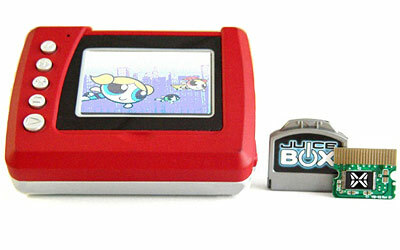 Juice Box is the first personal media player designed to meet the lifestyle and entertainment interests of today's tweens. One of the smallest and lightest personal media players on the market to date, the Juice Box enables tweens to play back pre-recorded videos in full-color and in stereo sound via headphones. Mattel chose Matrix 3DM for the Juiceware cartridges because it allows the company to achieve a quick turnaround time and faster time-to-market for pre-recorded content at the lowest cost. The solid-state nature of Matrix 3DM also ensures that the Juiceware cartridge would complement the lightweight, rugged construction of the Juice Box. "A key part of ensuring that Mattel provides the best products at the most affordable price is by keeping a close watch on innovative technologies, like Matrix 3-D Memory," said Phil Jackson, vice president, marketing, Mattel Brands. "Mattel is a pioneer in innovation, as one of the first to put Matrix 3-D Memory technology in the hands of tweens." "Matrix Semiconductor is supplying a medium for content publishing that provides the cost and time-to-market benefits that are essential for a truly effective publishing platform," said president and CEO Dennis Segers. "By virtue of having an industry leader like Mattel as one of our first customers, we are able to demonstrate that Matrix is ready to be a high-volume supplier to a broad variety of industries in need of low cost programmable memory formats." Matrix 3DM is an inexpensive, high-capacity, permanent, non-volatile memory and the first product based on Matrix Semiconductor's technology innovations. By designing memory chips in three dimensions, Matrix Semiconductor is uniquely able to maximize the use of silicon and, therefore, achieve extremely low cost for memory products.